Mysterium is a small, independent convention organized annually by fans of the Myst series of video games. The games are very heavy on book-related themes, and I wanted to bring some of that into the design of the site, while still featuring the “falling man” graphic that serves as the logo for the convention. This was a replacement for the convention’s old site, which was a very basic WordPress blog. For this rebuild, I wanted to improve the accessibility of important convention information, which had previously been buried on sub-pages, and eventually placed in a tacked-on header above the blog content on the homepage. 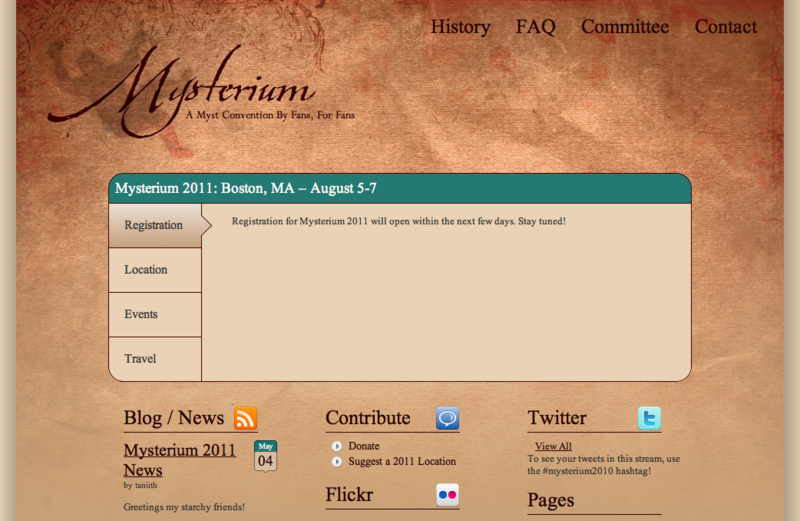 The tabbed collection of convention-related items and the prominent placement of the location and date – Mysterium is in a different city every year – rose out of this, as did the multi-column approach to the homepage. This design vastly improves the immediate accessibility of critical convention information and surfaces several social media components, while its spacious design ensures that the increased information density isn’t overwhelming. I also wanted to more prominently feature the various community involvement aspects of the convention, including the annual t-shirt design contest and various planning feedback polls. This led to the Contribute section on the homepage, which could be easily updated by maintaining the links collection in the WordPress system. Finally, previous years’ Mysteria had attempted to better integrate into social media through an initiative at my.mysterium.net. This never took off, and the concepts were instead folded back into the main site in the form of the enhanced Twitter and Flickr integration.